Bernie and Sophie in front of the thriving patch. Robyn Deed talks to Gardening Australia’s Sophie Thomson about her measured approach to watering in Adelaide’s challenging dry climate. To get the required level of watering for trees and shrubs, she’s a fan of low-pressure sprinklers (for example, Lo-Flo an Australian invention, WaterMark approved), which produce big drops rather than mist, or drip irrigation systems that can be turned on for the required period. The watering system might need to be on two hours once a fortnight to get the deep good soak the plants need—more water, less often is the mantra. But how do you know how much water is needed? Sophie advises that the best way is to look at what you’re doing now and adjust from that. “Start by watering as you normally do and then dig down next to the plant to see how deep the water has gone; it will often be just a couple of centimetres, but trees and shrubs need the water at their root zone, 20 to 30 cm down.” Adjust the watering time and volume to do this and so encourage strong deep roots. The most important thing is to create watering zones, grouping together plants with similar watering requirements—you’ll save water by only applying the required amount for that zone. These zones include ‘no water’ zones that survive on the natural rainfall alone once established; ‘low water’ zones that survive on infrequent watering (once a fortnight to once a month) once established; and ‘moderate to high water’ zones that require more frequent watering. Plants in the ‘no water’ zone may still need a year or two of irrigation to establish, and might even need one or two waters over summer in harsh years. In Sophie’s garden, the garden beds on either side of the driveway, where she wants a bold statement but cannot fuss, are part of the ‘no water’ zone. By contrast, her vegetable garden is in the ‘‘moderate to high’ water zone. She adds, “With plants that have a moderate to high water requirement of once a week or more, make sure that they are growing in the right position, and try to grow them where they are sheltered from harsh sun and hot winds.” And, by harvesting your own rainwater, you can water the plants as often as they require it, not governed by mains water restrictions. It is easier to design watering zones when planting a new garden from scratch, but even if you have an existing garden, often just by removing or relocating a few plants, you can rezone areas to take them from high to low water usage. So how has the ‘no water’ zone around the driveway worked? Sophie planted this in July 2014 as a wildlife corridor with local indigenous plants, which have had no supplementary watering after planting. Most plants have survived but some haven’t, particularly given the last, very tough, season. Usually the Adelaide Hills has a classic Mediterranean climate with rains from late April till late October, then six months without rain. This year, though, they had no significant rains from August, with a very hot December (seven days over 40 °C). In late January, they were fortunate to get three patches of rain. Sophie says, “It was a blessing, as a number of my local indigenous plants were really struggling, and a number have died after surviving for several years.” She’s had to occasionally water even in the ‘no water’ zone because of this. Sophie’s vegie patch is thriving, however. She has flowers throughout the patch to encourage beneficial insects, and she uses a number of approaches to watering. She has 10 wicking beds which she built herself (for around $20 each) and she’s found they need watering just once a week in general. One, however, needs much more frequent watering (similar to a normal raised bed) as she put in a tomato stake and pierced the plastic liner. She says it’s an open question how long the soil will last in them. With her beds, she’s expecting to change the soil completely every three years, because the water she uses is salty bore water. She’s hoping for more research and experiments to inform wicking bed use, but she likes the approach and says that they have been very successful for her. 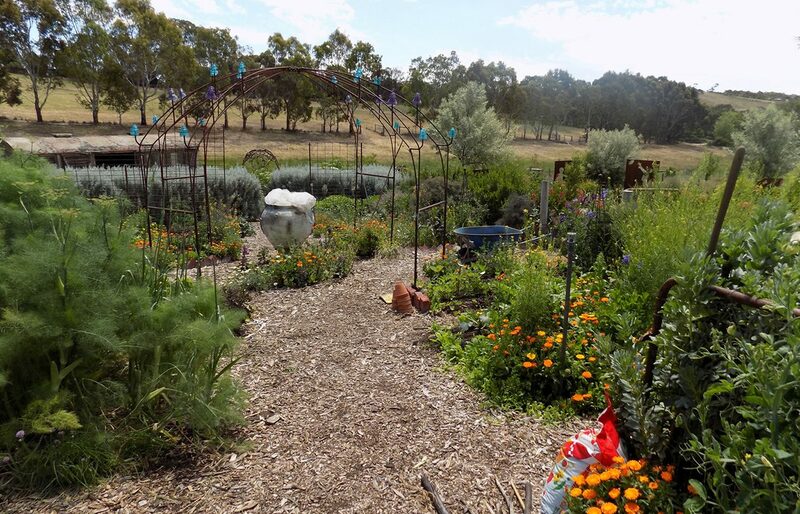 Elsewhere in the vegie patch, Sophie uses gravity-feed drip irrigation, using a system invented by a local Adelaide mathematician, which controls watering based on rainfall and temperature. Designed for developing countries without power or pressurised water systems, the system is called measured irrigation. It can be completely unpowered, just relying on manual monitoring of a watering gauge and turning the system on/off based on water level, or powered using a small solar panel to turn the system on/off as required. It’s the ‘as required’ that is particularly interesting—it uses evaporation of water in a container to indicate when watering is required. For more on the ins and outs of measured irrigation, see the box at right. Sophie’s system was installed by the inventor, Bernie Omodei, two summers ago. It’s been successful for her, though there have been a couple of teething troubles due to the salty bore water blocking dripper system hoses, so she’s learnt that there is some monitoring required to check on it—plant reading is always required by gardeners, as she notes! If it was using filtered water or mains water, that shouldn’t be a problem, she says. Sophie notes that mulch is another important ingredient to reduce water use. “We need to look at the mulch we use, though,” she says, “to look at its carbon miles and whether pesticides have been used in growing it.” She suggests choosing local, where possible; in South Australia, for example, lucerne and pea straw are often locally grown, though some lucerne crops do use pesticides. Her comments on mulch are just another indication of Sophie’s thoughtful approach to garden creation and maintenance. 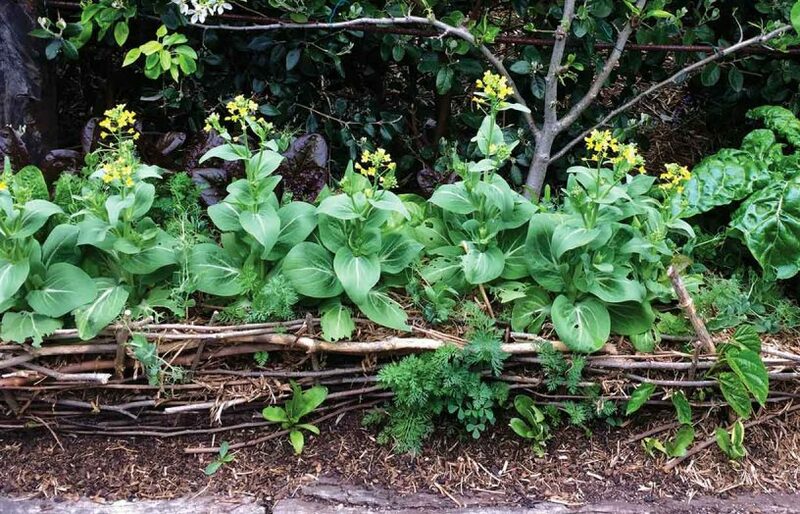 Sophie’s Patch is an inspiration for those considering how to have a productive, beautiful and sustainable garden with low water use. And even better, she shares her results with all of us via Gardening Australia! Measured irrigation was invented in 2011 by Adelaide-based mathematician Dr Bernie Omodei to enable low-cost water-efficient irrigation in developing countries without mains power or mains water. 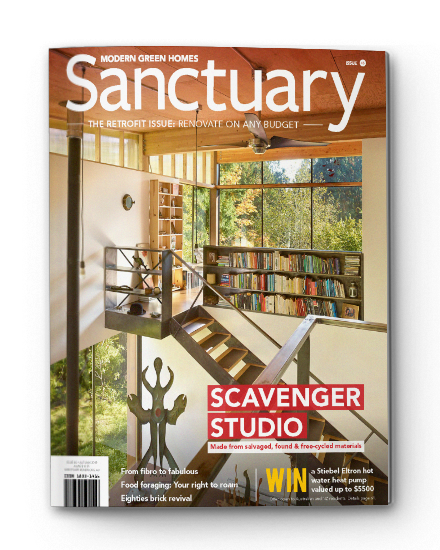 He’s been refining the system ever since, leading to it also finding a home in private gardens, such as Sophie’s, and in many community gardens. 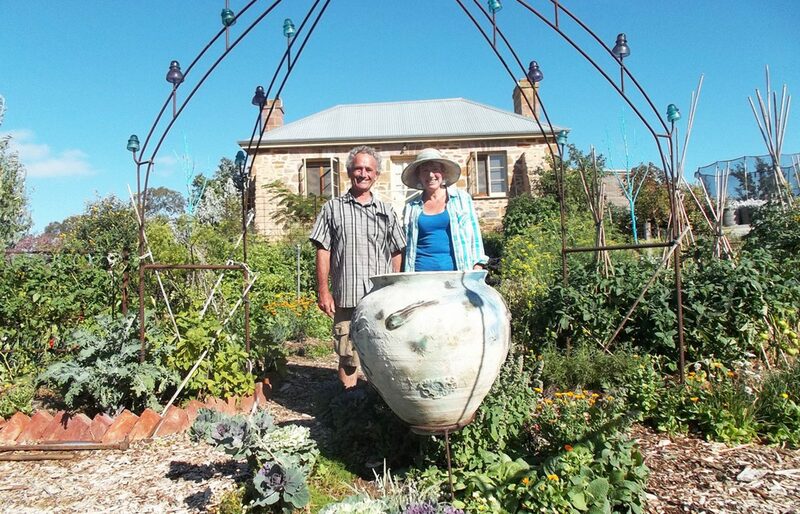 The first community garden to install the system was Fern Avenue Community Garden in Adelaide. They are still using it five years down the track. The system can be installed by Bernie or DIY, using a kit provided by Bernie. The diagram below shows how the system works. 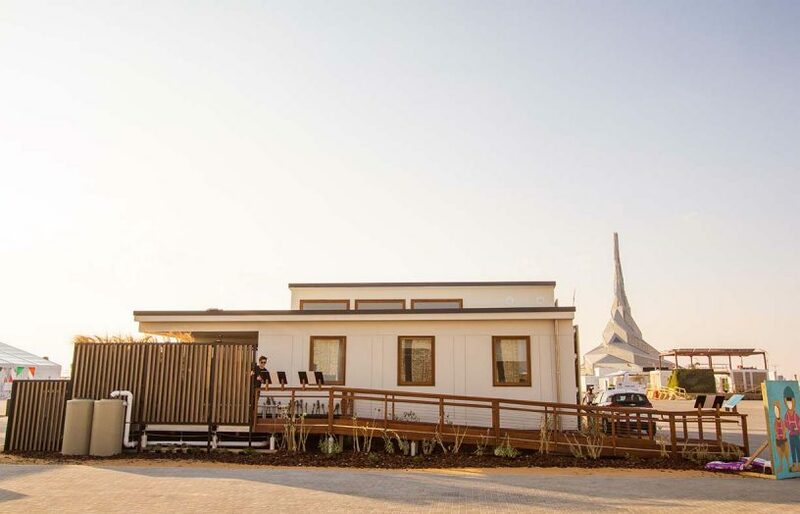 It uses a fall in the level of water in an evaporation container (which can be simply a bucket) to switch on or off the watering system, either automatically, powered by a solar panel, or manually. Thus the system is responsive to rainfall, heat and humidity. It’s a gravity-feed system rather than pressurised, a conscious decision to cater for areas without power or mains pressure water. Most automated irrigation systems are pressurised, but in many remote areas or when using tank water, that’s just not possible without expensive pumps requiring additional power. Pressurised systems can also cause problems with leaking around pipe joins. The system can be used with mains pressure water by diverting mains pressure water to a tank or flow splitter (as shown in the diagram) from which it drains by gravity. The drippers and lines used with the system are non-pressurised too, so you need to consider that if replacing an existing system. See more about Sophie’s garden at sophiespatch.com.au. 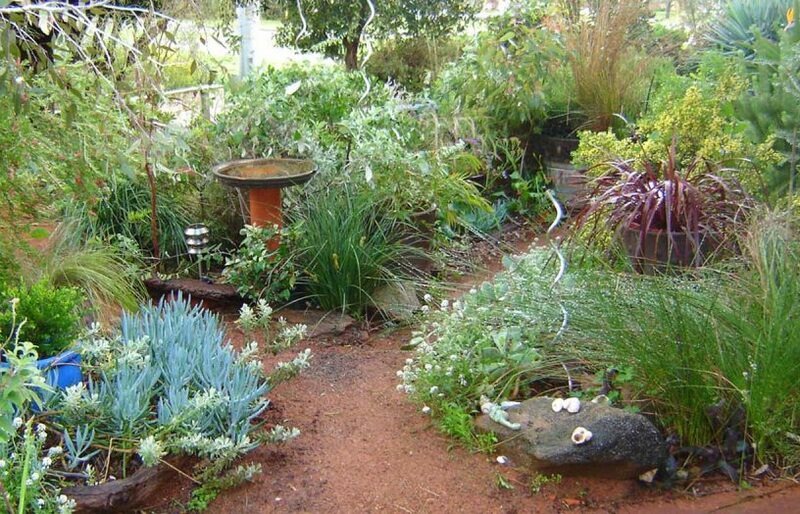 Some of the information in this article is adapted from Sophie’s book From the Ground Up—A Complete Guide for South Australian Gardeners, with permission. 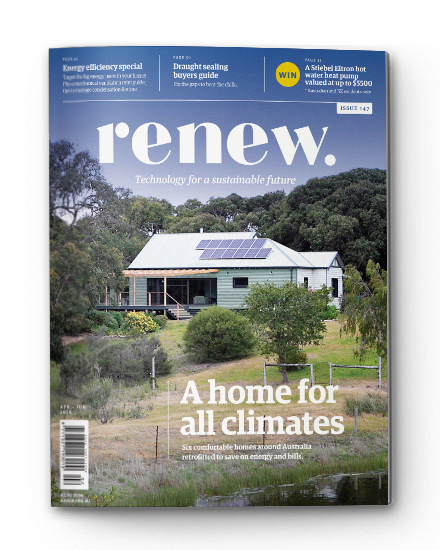 This article was first published in Issue 135 (April-June 2016) of Renew magazine. 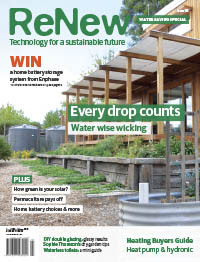 Issue 135 is a water saving special.